10,000 THANK YOUs … Celebrating 10,000 members in the Adafruit Discord Community! @adafruit @discordapp « Adafruit Industries – Makers, hackers, artists, designers and engineers! NOVEMBER 27, 2018 AT 3:34 PM Celebrating 9,000 Members in the Adafruit Discord Community! OCTOBER 10, 2018 AT 11:17 AM Celebrating 8,000+ members in the Adafruit Discord Community! JULY 5, 2018 AT 7:35 AM Celebrating 7,000 Members in Our Discord Community! JUNE 22, 2018 AT 9:56 AM Celebrating a year together as a community on Discord! 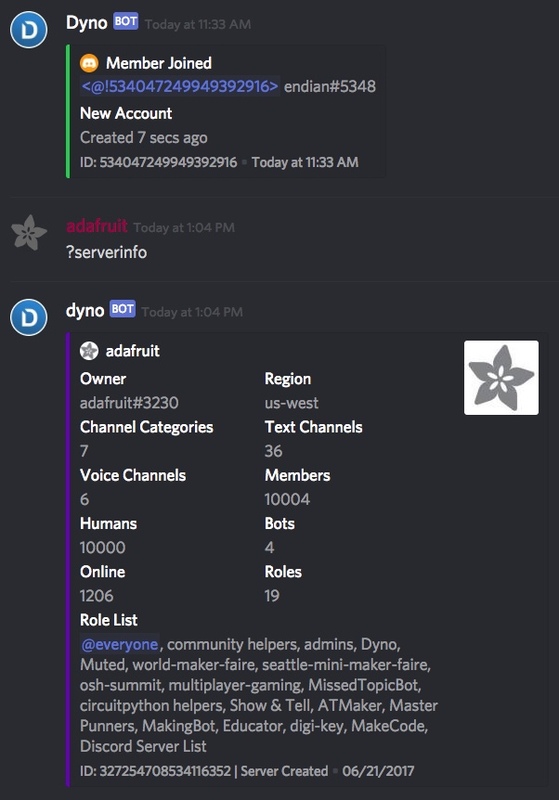 APRIL 13, 2018 AT 4:34 PM Adafruit community on Discord reaches 5,000 humans! DECEMBER 11, 2017 AT 3:05 PM Adafruit community on Discord reaches 3,000 humans! JULY 22, 2017 AT 5:11 PM Adafruit is a Discord partner yay! JULY 20, 2017 AT 2:45 PM Adafruit is on Discord.